This was not a good look. Some Democratic lawmakers sang “na na na na, hey, he-hey, goodbye” on the House floor as the bill passed. There’s principled opposition, and then there’s political gamesmanship, and today’s Democratic Party has a remarkable knack for choosing the wrong one at the wrong time. I assumed at first—as did at least one CNN on-air analyst—that it was Republicans celebrating the demise of Obamacare. But no: According to multiple reporters present, the song came from a group of Democratic legislators. The implication: By voting to pass the unpopular bill, GOP lawmakers had ensured that they’d be voted out of office at the next opportunity. This is both an homage and a literal repetition of what Republicans did when the Clinton tax bill passed in the House in 1993. Same singing, same song. The bill paved the way for budget balancing over the course of the decade and (more arguably) played a role in creating the prosperity of that decade. It also came little more than a year before Democratic majorities in both Houses were annihilated in the 1994 midterm. Be that as it may: It’s disgusting. This was not an own goal at a soccer game. It was not a vote noteworthy solely for its long-term effects on the partisan balance of Congress. It was a vote for a bill that, if signed into law, would likely strip health coverage from millions of Americans while potentially threatening protections for many more. It was not an occasion for singing. And it sure as hell wasn’t an occasion for celebration by the party that failed to stop it—the party whose members purport to represent the interests of the vulnerable citizens whom Trumpcare would affect. 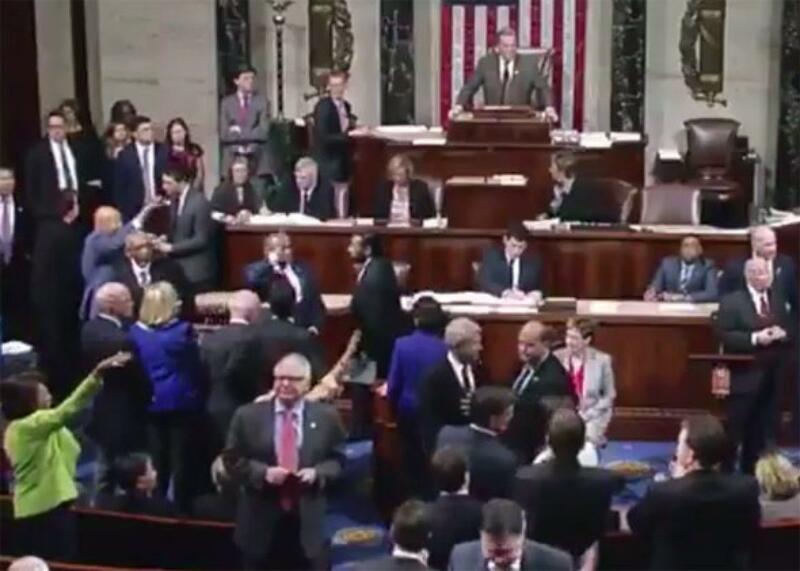 Lest anyone think these were the actions of a rogue few within the Democratic caucus, the sentiment echoed that of House Minority Leader Nancy Pelosi, who suggested earlier in the day that she welcomed the bill’s passage by the GOP-controlled House.
.@NancyPelosi: "Someone asked me, 'Why dont you stop them?' B/c we want them to define themselves ...They will walk this plank for nothing"
I get that Democrats are confident it won’t pass the Senate, where Republican legislators have already said they won’t work from the House’s bill but write their own. I get that the minority party is angry and lashing out from a position of political weakness. I get that they’re determined to make Republicans pay for the hypocrisy that characterized the process by which the bill was drafted, updated, and voted upon. And I get that they believe, perhaps rightly, that House Republicans will suffer at the polls for passing a broadly unpopular bill that appears to short-change their constituents. But come on, Democrats. If you really believe that Republicans are voting to hurt vulnerable Americans—that this bill would cost people their lives if passed—then you can’t act like the joke’s on the GOP. And, as a rule, if your whole strategy is to take the high road, then you’d better not turn around and take a moral-victory lap on the low one.